Piranha-Info.com is dedicated to some of the most feared, but at the same time misunderstood fresh water fish: Piranha's. 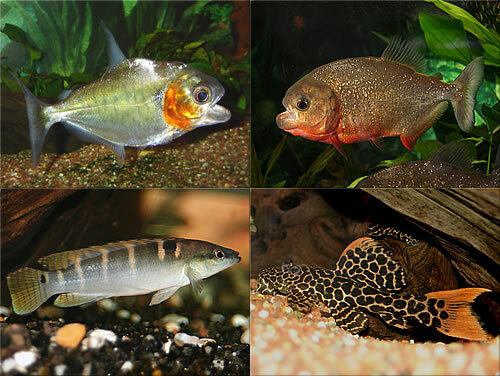 Supported by hundreds of photographs and illustrations, you can find extensive information about these much dreaded fish, factsheets of the various species known to science and available to the hobbyist, their behaviour in the wild and in captivity, and the many factors involved in responsibly keeping Piranha's in a home aquarium. Additionally, of course also lots of information about the Piranha's I kept myself in the period of March 2002 to October 2006. And lastly, you will find indepth information about my own aquariums, profiles of the other numberous species of fresh water fish I have kept past and present, and a page devoted to the some of the most commonly kept groups of South American Catfish, a group of fish that captured my imagination more and more. I hope you enjoy browsing this website as much as I did creating it! This site is optimized for a screen resolution of 1024x768 or higher. To display the site navigation, the Flash Player plug-in (version 8+) is required: download this plug-in. Visit the Site Log to read about all the latest additions, changes and new technical features.